Standing still: At the end of a historic week, where exactly are we with Brexit? Mary Lou McDonald says she told Theresa May over the telephone that a no-deal Brexit would mean a unity referendum in Ireland. AFTER A WEEK of turmoil in Westminster, which included a historic defeat for any British government, a number of last-minute letters and more resignations, where are we now with Brexit? In short: not even Theresa May knows. The British Prime Minister spoke to EU leaders Jean-Claude Juncker and Donald Tusk by telephone this lunchtime to discuss where to go next on Brexit. May had previously been in touch with Brussels only by text message since Tuesday, the day that the British parliament rejected the Brexit deal she signed in November, that lays out the conditions for leaving the European Union. The deal was defeated by a historic 432 votes to 202: in the last record for a UK government defeat was in 1924, when the Labour government lost by 166 votes. “Discussed with PM Theresa May the next steps on the UK side,” tweeted Tusk, who represents EU leaders as president of the European Council. 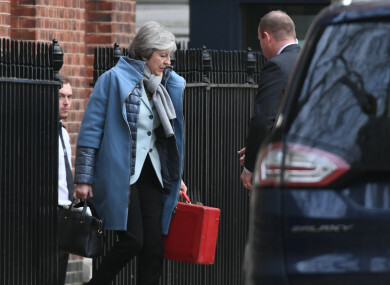 May also spoke separately with the head of the EU executive, European Commission president Jean-Claude Juncker, at her request. “It was an exchange of information on both sides. The two agreed to stay in touch,” a spokeswoman for Juncker said. “Spoke with Theresa May. Reminded her of the obligation of British State to honour and implement the Good Friday Agreement: that the backstop is the bottom line, that people of the North do not consent to Brexit. That there will be no hard border in Ireland and that a Brexit crash (or a no-deal Brexit) = unity Referendum. Theresa May must return to the House of Commons on Monday and present her plans to MPs on what to do next. Among her options are: further negotiations with the EU, which Tusk and Barnier have said previously cannot happen; requesting an extension to Article 50; call a second referendum, where it isn’t certain that the outcome would be different, or push for a no-deal Brexit, which would most likely lead to a border on the island of Ireland. Labour leader Jeremy Corbyn yesterday announced that he wouldn’t engage with Theresa May’s government until she ruled out a no-deal Brexit entirely. This is almost impossible to do: to avoid a no-deal Brexit, May needs to get the majority of the House of Commons to vote for a deal, which is proving tricky if not impossible. The House of Commons will then debate and vote on those plans on the 29 January. Legally, the UK must leave the EU by 29 March, two years to the day after Article 50 was triggered by Theresa May. Email “Standing still: At the end of a historic week, where exactly are we with Brexit?”. Feedback on “Standing still: At the end of a historic week, where exactly are we with Brexit?”.